Cleanup pathogen kit with disinfectant easily transforms liquid spills into an odorless, semi-solid mass for safe and sanitary disposal using a fluid absorbent powder (included). Kit contains all needed items to clean up and dispose of spilled bodily fluids, bloods, or other substances, following OSHA requirements rule 29 CFR 1910.1030. 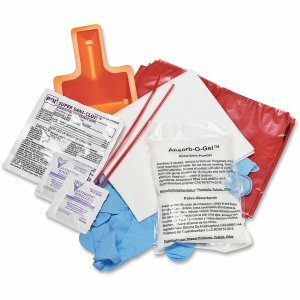 Kit includes one pair disposable gloves, one pair disposable shoe covers, one disposable apron, two scoops/scrapers, two red biohazard bags with ties, one disposable towel, one pair protective eyewear, one isolation mask, one 3 oz. packet of absorbent power, two antiseptic wipes, one instruction sheet, and one disposable wipe with HIV-1 tuberculocidal claim.